I am so proud of myself!! I’m really doing this! I have one more semester here at TCC before I graduate. 3.352 is my GPA. I only have two “C” marks. Those two were my hardest classes! Accounting and Calculus. 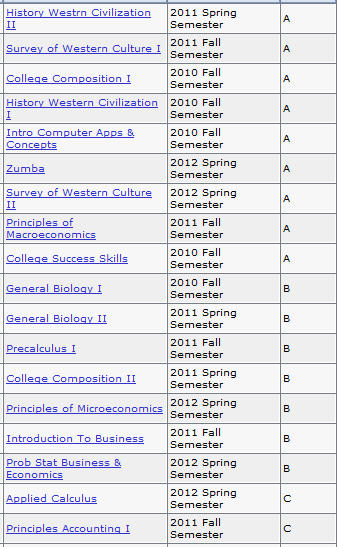 I am still proud of myself for those grades because I worked so hard for those!! I can not wait for my last semester to be over. I’m ready to graduate TCC! It will feel amazing. I have two required classes left:Spanish and Accounting II. I see a future of more good grades!!! Work it girl!!! That GPA spells honor roll for sure! Maybe even the President’s list! Accounting I know is hard but Spanish is fairly easy. I dont know what level it is but if it’s beginners, it’s easy. You start off with numbers, letters & go from there. I am on the fence about taking beginners versus intermediate. I know some spanish. I took it for three years in high school and I know enough to communicate with some of my coworkers. But I’m not sure where intermediate starts. I don’t want to be in there counting to ten in spanish, but I don’t want to be behind! !